When it comes to applying and removing my makeup, I've been turning to Swisspers products for years, which is why I'm super excited to be re-teaming with the Swisspers crew once again to share the importance of Sleeping Naked. 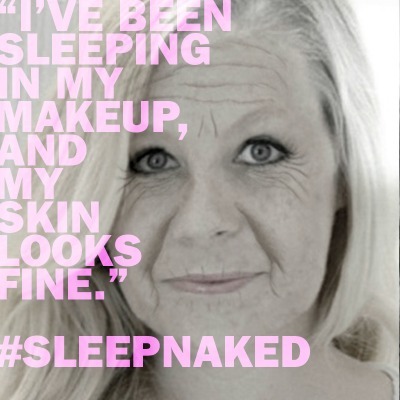 The Sleep Naked campaign urges young women to achieve a healthier skin regimen by ending the day makeup-free. Studies have shown that most women do not remove their makeup daily, and those that do, don't do it well, resulting in a variety of skin and eye issues. Swisspers is calling on women to Sleep Naked each and every night and adopt a beauty routine for cleaner and healthier skin. While proper makeup application is important, how you take it off is just as crucial. In case I wasn't scared enough about aging... Swisspers created the above age progression image of me to show what I would look like if I didn't take care of my skin over the years. Talk about a wake up call. I have a feeling this image of myself will be haunting me every time I feel too tired to properly remove my makeup. Thanks for the motivation... and the nightmares. :) Swisspers has also partnered with popular beauty vlogger Nikki Phillippi to create a dramatic aging video, which demonstrates one of the benefits of sleeping naked - preventing skin damage, which may lead to premature aging. GIVEAWAY TIME! Below is your chance to win a years supply of Swisspers cotton products and a $50 gift card. Simply enter by following me and Swisspers on Facebook and Twitter. Each follow gives you an additional chance to win! Good luck! Great post! I always take my makeup off before bed - it's a pain but so worth it! And I would be glad if you could check my latest post. I always take my makeup off before bed because I don't want to break out, and it will if I don't! I also don't want my skin to age faster either. I hope I win the giveaway!! Great post! truly I can't stand going to sleep with makeup on! and you are right! it's very important! I think you've made a very important post to all the ladies using make-up. Great job on showing everyone that make-up is important to take off. Keep up the good work. I always get lazy at night when it comes to taking off my makeup. I'll use a wipe, but I feel like that is not enough. This has definitely opened my eyes!! So true! I ALWAYS remove my makeup. Ok, I think there may have been like one or two drunken nights where I didn't and then I felt super guilty about it;). This is such a great reminder! It is so much better for skin to take makeup off before bed! Taking off my makeup is something I always do no matter how tired I am! As a follower of natural look I try to avoid on a daily basis any kind of "hard make up" so I usually do not use any kind of this products, except in some special situations. But as several ladies have already said I couldn't go sleep with make up on my skin. If I go to bed with makeup on my skin, its ruined by morning, im THAT sensitive. eek!! Creepy video. I entered the contest. Fingers crossed. Wow!!! I pretty much take my make-up off every night but I nights that I miss because I'm beat! But after this... I'll be taking extra care to take it off! Sounds great! I remove my makeup every night. It's so important! I think sleeping without wearing make-up is extremely important. Great post! loved reading this article! This is super interesting! I have problem skin myself so I am always looking for new ways to do things and I think adding a couple of extra steps seems pretty easy for the sake of better skin! I recently found Earno Lazslo Black Soap and love it! He has this strategic splashing technique that supposedly does wonders! A wrote about it also, check it out I think you would like! I don't usually wear too much makeup on my face, other than my eyes so I've never been too picky with taking it off. I guess I was incredibly naive to the fact that eye makeup can cause skin damage too. Thank you for this insightful post! Yikes. This was the last post I was going to read before turning off the lights at 2 am. Now I have to get up and go take off my makeup first. agh. OMG that is cray cray!!! I am religious about taking off my makeup at night, and even more so after seeing this!! Yikes!